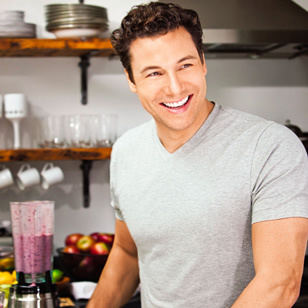 Chef and cookbook author Rocco Dispirito shares his weight-loss secrets. Rocco DiSpirito, reality-TV star, cookbook writer and former chef-owner of Union Pacific, a 3-star New York City restaurant, flirted with a healthier lifestyle for years. But it wasn’t until a routine checkup in 2006 that DiSpirito got a wake-up call and decided to take action. At 216 pounds, his heaviest, the 6'1" chef had high cholesterol and high blood pressure. Rather than take medication, DiSpirito, now 46, vowed to radically change his diet and amp up his exercise. Three months later he completed his first sprint triathlon. A year later, and 30 pounds lighter, he completed an Ironman. Here DiSpirito, author of Now Eat This! Diet and Now Eat This! 100 Quick Calorie Cuts (Grand Central, 2011) and star of Bravo’s Rocco’s Dinner Party, talks with us about his transformation. How has your eating changed since you decided to improve your lifestyle? I used to eat anything I wanted. At Union Pacific I packed fat into dishes for flavor—and I rarely ate at home. Now I cook a lot of vegetables and fruit, whole grains and lean protein and use those foods in healthy makeovers of comfort foods for myself and my cookbooks. My Flash-Fried Chicken “Carnitas” [Now Eat This! Diet]. It’s fast and comes out so delicious at 280 calories. How was your first triathlon? When I started training, I couldn’t even walk three miles. I’d never been able to swim. During the race women 20 years older were swimming by me like I was standing still. I was the second-to-last person to finish. Normally I would have been disappointed—but I felt triumphant. Photo Credit: Jonathan Pushnik used by permission of Grand Central Publishing, Inc.